Various biotic stresses induced by microbes/pathogens affect growth, yield and production in plants. Plants sequester a broad spectrum of receptor armory to instigate innate immune approaches which are unbeatable by pathogens. Several phytohormones, interact in multifaceted interconnected signaling networks. Recent studies have elucidated direct or indirect regulation of plant defense responses by phytohormones. 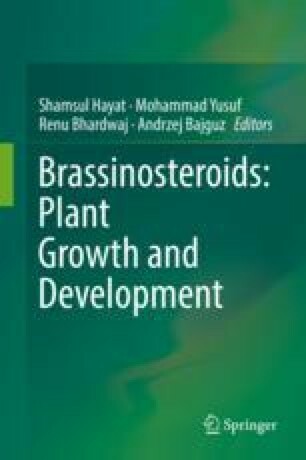 Brassinosteroids (BRs), a growth-promoting hormone is also an imperative plant defense regulator. They have been recently observed as a modulator of plant defense response to pathogen attack. They enhance plants resistance to a wide array of plant diseases. BRs increase the efficacy of Pathogen Assisted Molecular Patterns (PAMP) triggered immunity. They also mediate crosstalk between different defense-signaling cascades including phytohormones signaling, DELLA proteins, Pattern-Recognition Receptors Triggered Innate Immunity (PTI) and plant pathogen interaction. Furthermore, BRs also regulate sulfur metabolism and production of nitric oxide and consequently affect plants immune responses. Yan, H., Zhao, Y., Shi, H., Li, J., Wang, Y., & Tang, D. (2018). BRASSINOSTEROID-SIGNALING KINASE1 phosphorylates MAPKKK5 to regulate immunity in Arabidopsis. Plant Physiology. https://doi.org/10.1104/pp.17.01757.